There’s the infamous Pat’s and Geno’s cheesesteak war, but there’s an even fiercer rivalry in Roxborough between Chubby’s and Dalessandro’s. They’re right across the street as well. First stop was Chubby’s. They have dining at the counter as well as booths. And they serve booze! Along with beer. 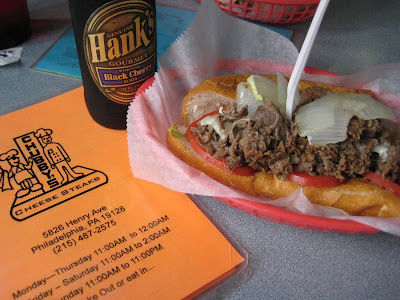 Here’s my half of the cheesesteak, and my Hank’s black cherry. After I bastardized mine with ketchup. Yes, I love me some ketchup on my cheesesteaks. And not just on top either. I make sure to incorporate it throughout the meat. You know what I love on cheesesteaks? Sweet peppers. They weren’t on the menu so I didn’t ask for them. And I didn’t find out until I’d finished my steak that they have a pepper and pickle bar! And you can load your steak up with whatever peppers and pickles you want. Hot, sweet, in between, they got em. Gosh, they need to mark this better! 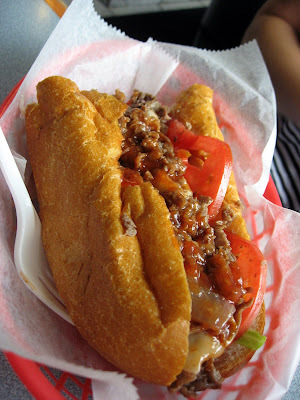 I enjoyed this cheesesteak. Good roll, good meat, good onions. The onions are a bit on the big side though, unnecessarily so. Service was excellent. We enjoyed her, and she enjoyed us! Then we walked across the street to Dalessandro’s. They have beer, but no full bar. Their dining area is also hurting. It’s quite a small space. There’s some counter space, and no real booths. They just have a handful of long skinny fold out tables up. No comfort, just function. There’s no waitresses either. You put in your order and then hand you the food. You sit wherever there’s a spot. Ok, so I didn’t actually try the Dalessandro’s, because I was full from my half at Chubby’s. Sorry folks, I didn’t fast or purge before I came. But I will say just from looking at these, they look better to me. The meat is chopped up a lot more, and so are the onions,and you get more onions! Amongst the diners, it was split about 50/50 over who preferred Chubby’s and who preferred Dalessandro’s. Next time, I will actually try one at Dalessandro’s! Then I’ll give you an informed opinion, although I’m already convinced I’ll like the Dalessandro’s one better! They also had a bigger and wider selection of peppers at Dalessandro’s. And it wasn’t hidden either! Don’t bother with Pat’s and Geno’s. Skip that nonsense and head up here for the real cheesesteak war! Dalessandro’s is and always will be the best STEAK over Chubby’s.